Spontaneous activity is transient - as neurons mature, they acquire adult properties, which usually do not allow embryonic behaviors. Each embryonic stage of SA has a unique phenotype of activity, with patterns retraction preceding cessation of SA. We are examining the mechanism(s) of these phenomena. 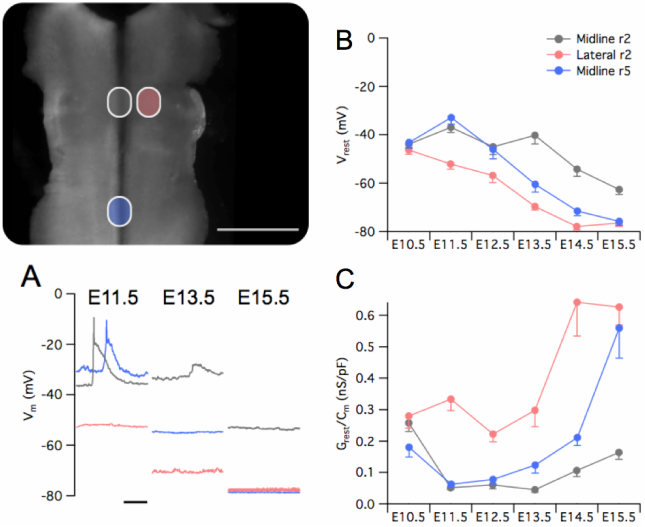 Spontaneous activity had different spatiotemporal properties at each embryonic stage - over developmental time, it retracts first from lateral and caudal regions to the InZ (E11.5-13.5), then from the InZ itself, so all SA ceases. Diagram courtesy of Hiro Watari. How might this happen? We find that the spatiotemporal properties of SA are stage-specific, due to specific ion channel expression patterns. Patch clamp recording over developmental stages shows that cells progressively hyperpolarize (A and B) and increase a resting K conductance (C). This happens first in lateral cells (red symbols). then in caudal cells (blue symbols), and lastly in the InZ (grey symbols). The physiological consequence to the cells is that they hyperpolarize such that t-type Ca channels cannot spontaneously open, and the increased conductance is not conducive to spontaneous depolarizations. Watari et al., 2013. We are now characterizing the K channels involved, and determining how those channels are regulated. More stage-specific characteristics - unusual looping behavior! In E12.5 brainstem, events initiate at the InZ (*), as normal. When events reach the isthmus, they are able to loop around the isthmus (timepoint 7.4 sec); they then propagate back to the InZ and CAN loop repeatedly at the isthmus. These loops can continue for many tens of minutes. Watari et al., 2014.